An American flag flutters on an M47 tank shortly after its arrival June 27 at Wyman Living History Museum. 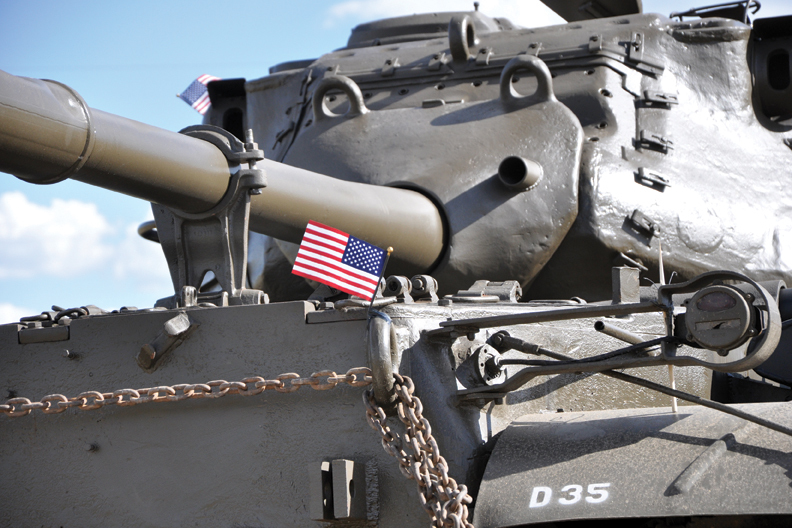 Lou Wyman, the museum’s founder, purchased the newly restored tank five years ago and plans to display it during today’s Fourth of July parade, scheduled to start at noon at Veterans of Foreign Wars Post 4265, 419 E. Victory Way. A few people lingered June 27 at Wyman Living History Museum, their eyes trained on the road. Finally, the tractor-trailer came into view. It turned from U.S. Highway 40 into the museum’s driveway towing its long-awaited cargo: an M47 tank, an Army green behemoth with a fighting weight of about 100,000 pounds. “I was just pleased to see it,” museum founder Lou Wyman said Tuesday. The massive war machine will make its debut today during a Fourth of July parade, which begins at noon at the Veterans of Foreign Wars Post 4265, 419 E. Victory Way, and continues down Victory Way to Craig Post Office, 556 Pershing St.
Its arrival marked the end of a deferred dream to bring the tank, which Wyman purchased five years ago, to Craig. Its shipment from Bryan, Texas, courtesy of Anson Excavating & Pipe Inc. — who hauled it no-profit — was tentatively scheduled then delayed several times. The tank, used in the Korean and Vietnam wars, took half a day to load on the trailer. Tank and truck combined grossed about 141,000 pounds. “We were right on the legal limit,” said Kenny Seales, who drove the tank back to Craig for Anson Excavating & Pipe. Smoke from the Last Chance Fire near Limon closed down the road for a few hours, and a truck fire on Eisenhower Pass diverted Seales to Loveland Pass, where Seales got a little more than one mile per gallon as the truck crept up the mountain, he said. The tank didn’t pass through its winding route unnoticed. “I couldn’t tell you how many thousands of people gave us thumbs up, waved at us (and) took pictures of us,” Seales said. As the tank slowly rolled off the trailer at the museum, its sheer size came into sharp focus. Standing 10 feet high, it dwarfed the men who gathered around it to get a closer look. The M47 isn’t exactly an agile piece of military technology. It tops out at 30 mph and guzzles four gallons of fuel per mile. What it lacks in swiftness it makes up for in sheer brawn. Its capable of carrying three machine guns in addition to the formidable 90-mm main gun. Its 12-cylinder engine churns out 810 horsepower at 2,800 revolutions per minute. All told, the machine cost about $60,000, Wyman said. That figure may seem like a weighty price, but considering it cost about $150,000 to build in the early 1950s and has since increased in value, Wyman agreed he got quite a steal. It’s not everyday an avid collector like himself can lay hands on an M47, or any tank for that matter. Craig resident Jim Meineke remembers the war history connected to Wyman’s new acquisition. He lived it while serving in the Korean War with the U.S. Marine Corps. A tank — maybe even an M47— positioned itself over him while he lay unconscious on a battlefield just north of the 38th Parallel, the line of demarcation that separated Communist-backed North Korea from its democratic neighbor directly to the south. The crew inside pulled Meineke to safety, possibly saving his life, he said. “It kind of tickled me when Lou told me about (the M47 tank he’d purchased) because it shows patriotism on his behalf and on the behalf of the people he’s associated with,” Meineke said. The tank’s electrical and hydraulic systems need work, but Wyman hopes some mechanical know-how and manpower will fix that. Several residents have offered to help, including Damon Hatfield, a Bobcat mechanic at Tri-State Equipment. “I think it’s kind of neat just to get to work on a piece of history,” he said. The project conjoins his fascinations of heavy equipment and military history. He learned the latter from his grandfather, Craig native Jack Mann, who was a tank commander in Gen. George S. Patton’s Third Army during World War II, he said. Bringing the machine to full working order will give visitors a rare glimpse into how the machine operated, he said. This goal — bringing a memento from another era roaring back to life — is why he’s glad to devote some of his free time to the project. Well, maybe it’s not the only reason. “Hopefully, I can drive it and see what it feels like going down the road,” he said laughing.